Strong leadership is essential to the success of any organisation and in today’s world strong leadership must be realised at all levels. When leadership development fails, performance gaps increase. This adversely impacts company culture, delivery of organisational objectives and the bottom line. This book was written to change the way leaders think about and drive performance development for their leaders. It takes the guesswork out of performance development and the critical conversations needed to support behaviour change. Good leaders advise their direct reports how to reach their potential. Great leaders inspire their direct reports to unleash their own potential for themselves. This book shows you how it’s done. Human behaviour is complex. Developing leadership in others takes more than knowing the theory, having a few quick conversations and authorising the training budget. Bringing out the best in your leaders can be challenging and time consuming and often leaders give up because it is too hard or they simply don’t know what to do. This book is for any leader who is serious about improving the leadership capability in their team or organisation. Developing Direct Reports really does take the guesswork out of leading leaders. Drawing upon their extensive experience in leadership development, the authors share their proven approach for having meaningful development conversations that deliver sustainable performance improvement. take the guesswork out of developing your direct reports into better leaders. Compiled as a ready reference to address leadership development challenges in the moment, regular application of the mindset, principles and strategies in this book delivers benefits for both the reader and their direct report leaders. The book invites the reader to take a committed approach to leadership development and to improve his or her own leadership capability as well. With its inclusive approach to leadership development this book supports leaders to become skilled at catalyzing behavior change thereby unleashing performance potential at an individual and organisational level. Corrinne Armour: Waging a war on wasted potential, Corrinne’s mission is empower leaders and teams to get out of their own way and embrace ‘fearless leadership’. Known for her innovative approach, results focus and the ability to tell it like it is, she is recognised as a provoker of change and growth. After living in Asia for a few years, Corrinne cooks a mean curry. Anneli Blundell: As a professional ‘people whisperer’, Anneli has been working with leaders and teams to improve their communication and interpersonal intelligence for almost a decade. She brings to her clients a recognised expertise in the field of ‘below conscious communication’ and motivation and is obsessed with decoding people and performance dynamics for improved results. Anneli also rates herself as an excellent parallel parker. Belinda Cohen: Performance improvement is at the heart of all Belinda’s work. With a natural curiosity for what drives behavioural diversity, Belinda brings a non-judgmental, supportive and ‘no excuses’ approach to her clients. She combines her legal and leadership experience with her passion for helping people work smarter. Belinda assists her clients to simplify the complex to bring about fresh perspectives and a new focus. Belinda’s ability to plan and book travel of any kind is an enviable skill. All three are accomplished speakers, trainers and mentors. Together, they have published two other specialist reference books on shifting human behaviour. They are all passionate about their family, the privilege of doing great work with wonderful clients and quality dark chocolate. Review : As a coach and facilitator in many organisations I recognise a huge need for a readable and practical resource for leaders both new and experienced to help them understand how to get the best out of the people they lead. This book comprehensively identifies the derailers and how to deal with them. Taking such a complex topic and arranging in such a digestible and understandable “how to” manual is a huge task that Corrinne, Anneli and Belinda have done superbly. I grabbed it to read on a flight to Brisbane and did not put it down until done. It is not only well written, but worth every leader having a copy to read and enjoy, and then come back to as the inevitable challenges of leadership arise. I will be recommending that all my clients keep their copy close by. Review : I have recently stepped into a new leadership role. 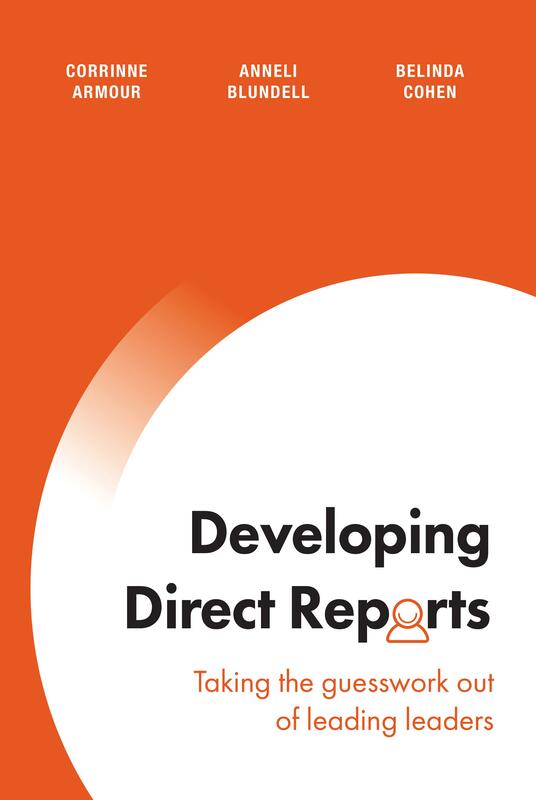 Understanding the 12 Derailers in 'Developing Direct Reports' is helping me identify where each staff member is at, and what support they need. I am also mindful that I need to manage myself to manage the team, and the book is giving me insights into my own leadership style. Review : This is a GREAT book with some fantastic insights. The way it deals with what people are really thinking is fantastic. I have been using the tips and ideas as a basis to coach new managers! I recommend this book for managers and people who support them.